Yep, I came close to losing it this week. I found myself miserable and frustrated as I took a walk with my 22 month old still recovering from cleft palate surgery. Because I felt myself sinking pretty low, I decided to force myself to memorize Psalm 25 while I pushed her stroller. To be honest, I didn’t feel like praying, memorizing a verse, or praising. I wanted to wallow in my self-pity. Tired, I could barely muster up a desire for anything. Then, that made me feel guilty. You know that endless cycle that leads no where good? Yeah, I was on it. Imagine a child whose mouth looks like a railroad track because of an extensive, terribly painful surgery on a cleft palate. Imagine sleeping with that child and waking in the night multiple times to give pain meds or to be wacked on the head with her no-no’s meant to keep her elbows straight so that her hands stay out of her mouth. In the midst of recovery, two more kids need attention. Work includes trying to re-brand, shoot videos for a pro-life conference in India, writing curriculum, teaching, recruiting board members, setting organizational plans and goals, fundraising dinners, editing a manuscript, not enough staff, and making international plans for 2016. In the midst of recovery and work, global and local news is grieving you and you want to get on a plane to help the Syrian Christian refugee crisis and South Carolina’s flooding. Why are you sitting in TN? Oh yeah, a surgery… What if she gets a fistula? What if she can’t learn to talk? What if she doesn’t want to talk? On and on – you get the idea. Well, that was our scenario that led me to see the need to memorize Psalm 25 the next morning. Complete exhaustion, complete frustration, complete discouragement, and complete confusion made me know I better do something intentionally to find my sanity in God! So I walked with the first six verses copied on a notecard. I found I could not move past verse one. As tears came down my face, as Phoebe squirmed and cried, I began to talk to God a bit loudly in my neighborhood. I wanted to rail against the verse and question God’s presence, God’s desire to be inside my circumstances. Physical exhaustion can do that. So after some tears and words with God, I again paused. That morning I did battle with my flesh. I commanded my will to trust. God showed me two key components of trust on that overwhelming day. I want to share those two thoughts with you in case you find yourself as discouraged as I was. Remember God’s Character. That morning I was reminded that though I am frail and weak and have human limits, God is fully trustworthy. Those who hope (trust) in God will never be put to shame (Psalm 25:3). We place our trust not in what we can see, not in what we can measure, and not in what we can do ourselves. We place our trust in the Person of God. I imagined taking my heart and hanging it around Jesus. I had to choose to remember that God sees and knows and leads. He knows my heart, my child, my family, my work, my world. Choose to invite God into your circumstances. I have heard over and over in my life people say, “God will not give you more than you can handle.” I fully disagree with this statement. If this were true, then why would we need God? Rather, I believe God intentionally places us in circumstances way beyond our potential. We as humans want to depend on ourselves, and I recognize this in myself a lot! So on that walk, I repeatedly told God, “Help.” God has manners. He usually won’t push His way in. He waits to be invited. On that day, I had to intentionally invite God into my circumstances. He was already there of course, but I had to invite Him to share my heart and my burdens. As I stated verse one over and over, I found myself not just inviting God into my circumstances but actually welcoming God into my circumstances. That day with Phoebe’s recovery did not get much easier, my plate was still full, and my discouragement kept threatening to overwhelm. But the short phrase lingered long into the night. In the midst of my struggle, I discovered again that we can with God’s power command our hearts to trust regardless of our emotions. And when I walked into my house, an email and a text came within five minutes of one another from two friends, “Can our family bring your family dinner this week?” Yes, God can be trusted. And God often uses His people who live with intentional service to others to remind us of that Truth. 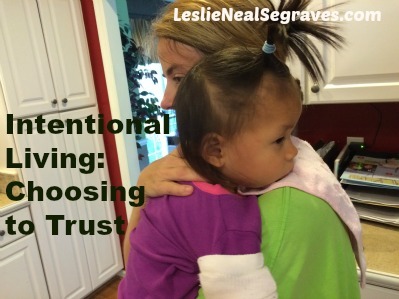 Question: Have you ever felt so overwhelmed that you had to intentionally choose to trust God? Would love to hear your stories! Lesley, thank you so much for sharing your heart, you’ll never know how I needed to “hear” (read) this. It so spoke to me where I am, where I’m struggling, floundering, hurting. It also made me see you in a different light….you don’t have it “all together”, have all the answers, or have God “at the tips of your fingers”…..(not sure I worded that right, but hopefully you know what I mean)……you struggle too. Thank you for sharing your heart and for the encouragement you’d shared with me. Hugs and love, sister. Oh Regina, I am thankful that my story of struggle helped you a bit. I just stopped to pray for you in whatever is going on in your life. I personally realize more and more that I don’t have it all together and that that reality is okay because God does! I agree with you – I think it does help to know we are not the only one in life who feels we are floundering and struggling. Hugs and love back to you! Hopefully we’ll run into you over Thanksgiving at some point!